Surviving 16 sometimes challenging years, Stoneground grows up. Bob McCarthy sure has staying power. After his funky roadhouse Garage on Beck sustained extensive damage from a fire that erupted in an adjacent vacant lot a few years ago, the smart money said that he would walk away from the place. About the fire, he says on the Garage's website, "It was like a punch in the gut. It was like a loved one getting hurt. It made you want to cry." Though he might have cried, McCarthy didn't walk away. He and co-owner Marsha Merrill stayed. They rebuilt. And today, the business is going stronger than ever, serving up excellent local and national live musical acts along with their Dixie-meets-Utah style of cuisine that includes funeral potatoes on the same menu as chicken and waffles. Running a restaurant—or working in one—requires nothing if not endurance. Again, McCarthy has it in spades. His Stoneground Kitchen has been open for 16 years, but it sure hasn't been easy going. Most restaurateurs I know keep their thoughts pretty close to their vests. Not him. When I ran into him recently as I was leaving Stoneground, he confided, "If I had it all to do over again, I'd never open a second-floor restaurant." Stoneground is located one story above the street on 400 South across from the Salt Lake Public Library, so a lot of people aren't aware it exists—even when walking right past it. And then there were the years of financial losses during the period when the city virtually shut down 400 South, while the TRAX lines were being built. Still, he stuck it out. And now, Stoneground is better than it's been at any time in those 16 years. It's not a chef-driven restaurant in the way that, say, Metropolitan or Forage was. But McCarthy knows talent when he sees it, and he very smartly scooped up über-talented chef Justin Shifflett (formerly of Metropolitan) to oversee the menus and cooking at both Stoneground and the Garage. Not every chef can comfortably pivot with ease from funeral potatoes to halibut cheeks with morel mushrooms and vanilla bean saffron sauce. But Shifflett can. In addition to a terrific new chef, there's another reason to visit Stoneground if you haven't been there in a while, as I hadn't. Gone are the pool table in the middle of the dining room and the pizza parlor atmosphere. It's been given a major makeover, which includes a gorgeous upstairs patio and décor that is contemporary but feels homey, with lots of natural wood and stone (including the dining tables) and a color palette that is serene and soothing. I was blown away the first time I revisited in years. As you enter the restaurant, there's a bar area on the right, and I recommend making time to have the bartender whip up one of his specialty cocktails—like the St. Julep, made with bourbon, St.-Germain Elderflower Liqueur and fresh mint. There's seating at the bar and tables adjacent, if you prefer lounge-type atmosphere over the larger dining room. Entering the main dining space, you won't be able to miss the big, imported pasta-making machine on the left; it's about the size of a Mini Cooper. And, boy, does it produce perfect pasta. The wine selection also took me by surprise. It's not the largest in town, but there's a hearty all-Italian collection of wines from excellent producers such as Cusumano, Allegrini, Planeta, Marco Felluga, Alois Lageder, Pacherhof, Scaia and Argiolas, with most being available by the glass or bottle. Years ago, the chef/restaurateur/celebrity Mario Batali turned me on to one of his favorite Italian wines, and it's available at Stoneground: Maculan Pinot & Toi (a blend of pinot blanco and tocai) from Veneto. While sipping a glass of Pinot & Toi, an order of focaccino ($6) to nibble on is a must. There used to be a restaurant in Brooklyn (McCarthy is from back East) called Focaccino, so maybe that's where they got the name; as far as I know, the word doesn't exist in Italian. Anyway, think baked, slightly charred pizza dough that puffs up like Indian puri or a Mexican sopaipilla. It's delivered to the table steaming before a server deflates it by cutting it into slices. The focaccino is lightly sprinkled with Adriatic sea salt, dried oregano and garlic oil, and served simply with an irresistible pomodoro sauce for dipping. It would make for a great bar snack if you just want to drop in for a drink. Another sensational starter is the Italian fish fry ($13), which is lightly crusted, deep-fried calamari, shrimp (or halibut cheeks when they're in season) and anchovies sprinkled with fennel seed and served with citrus peel aioli. We've been lucky to have a top-notch server named Dillion (aka Dillicious) during a couple visits. He's very knowledgeable, and shares his own food writing online at Dillicious.xyz. He recommended homemade black tagliatelle (made with cuttlefish ink) and it was spot-on: wide, flat pasta cooked perfectly al dente in a light chardonnay-cream sauce with lobster claw and knuckle meat, roasted mushrooms, scallions and red pepper flakes ($23). 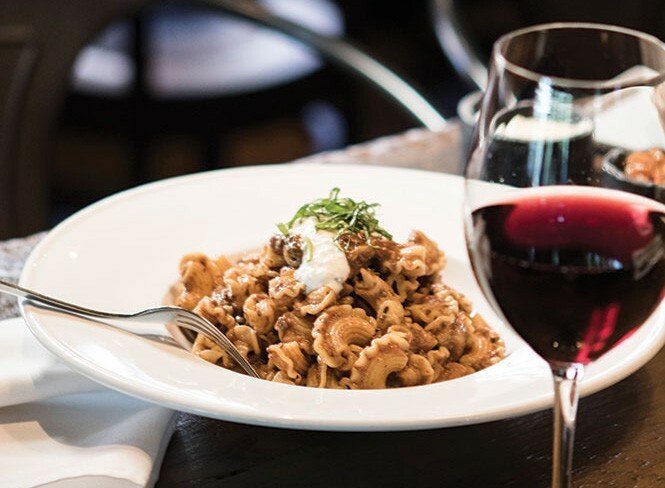 Other satisfying dishes I recommend include creste pasta Bolognese, chicken piccata with fresh linguine, the caprese salad and any of the thin-crust, artisan pizzas. Born in 2000, Stoneground Kitchen is maturing beautifully. I'm sure glad McCarthy didn't pull the plug on his second-story eatery.